Society secretary Andy Exton FRAS visited the Wharfe Beavers of Westborough Methodist Church in Scarborough on Friday 26th September. 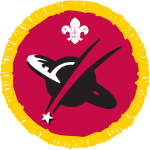 The Space Activity Badge is a newly launched badge from the Scout Association for Beavers and this was the first group that SARAS have assisted in achieving. Identify some of the things you can see in the night sky, for example stars, planets and the Moon. Identify at least one constellation you can see. Be able to name the eight planets in our solar system. Find out about a current space mission. The group had previously visited the Scarborough Star Disk in the South Bay to learn about some of the constellations visible in the night sky and had made their own Solar System models. Andy helped them learn more about the planets and moons in our Solar System, some of the recognizable constellations visible from Scarborough and gave some info on current space missions including the International Space Station, Curiosity, Rosetta, MAVEN, Mangalyaan and New Horizons. 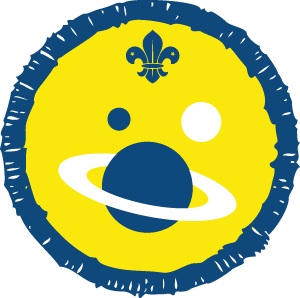 If any other local scout groups require assistance with space and stargazing activity badges, please do get in touch. This entry was posted in News, Public Outreach, Scouts / Guides and tagged Andy Exton FRAS, Beavers, Curiosity, International Space Station, Mangalyaan, MAVEN, moons, New Horizons, Planets, Rosetta, Scarborough Star Disk, Solar System. Bookmark the permalink.